Today was Dear Jane class for this month. 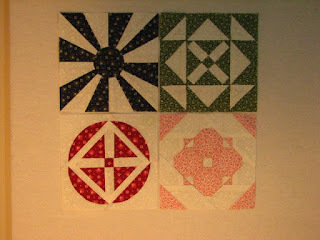 I finished a total of 4 blocks - twice as many as I did last month, so I'm feeling pretty good about myself. The class took a vote over email this past week and the results were released today. We are extending the class to June of 2014. That sounds really, really far away - but, it comes with a bonus! The number of blocks we have to complete per month is dropped considerably. Fantastic! Over the summer I'll catch up on what I'm behind in and will be able to sew other things too, since I'll only have to finish 5 blocks per month, rather than 10. 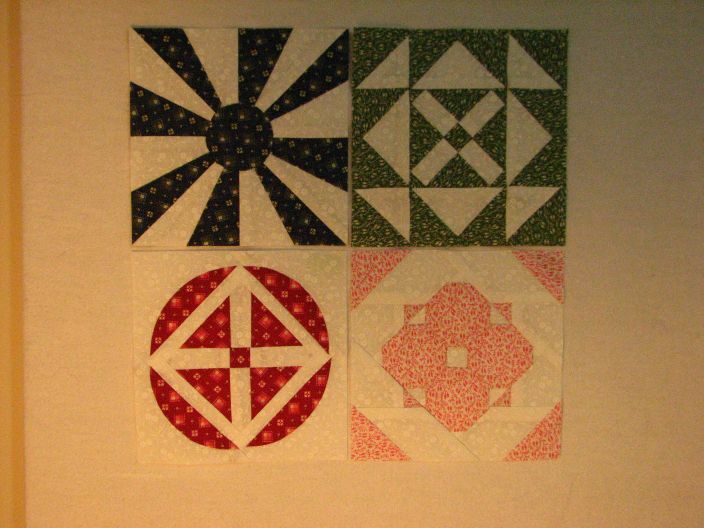 I have to sew the first 4 rows together over the summer and need to do 12 blocks to get that done. Then I should only be behind by about 30 blocks. Today I finished off some crib shoes for a colleague. The baby (a boy) was born in mid-April. This colleague and I share the same first name, so we've always had a bit of a connection. They look kinda orange in this light, but really they are red, with mustard coloured monkeys on them. The inside is the same colour as the monkeys. They are cute as can be and man, babies have small feet! They are sized 3-6 months, so they should fit the little fella just fine. The pattern is by Sweat Pea Patterns who had a sale on awhile ago and I bought a bunch of different varieties of crib shoes. My next projects are all practical ones: throw cushions and an ottoman cover for a friend and new drapes for me. I need to get my machine serviced soon too, so will have to plan that date out carefully - usually I do it when it coincides with a bunch of marking, when I don't have time to sew anyway.